EU leaders offered Theresa May sympathy today, but no promises. Theresa May pictured at the European Council Summit in Brussels today. TAOISEACH LEO VARADKAR has discussed possible remedies to the ongoing impasse over the Brexit deal with Theresa May. On Monday, the British Prime Minister postponed a crucial House of Commons vote on the draft Withdrawal Agreement so she could seek additional assurances on the backstop element of the deal. May, who survived a confidence motion in her leadership of the Conservative Party last night, held further discussions with EU leaders at a summit in Brussels today. Varadkar said the EU might be able to give Britain “a greater assurance” that speedy talks on a new UK-EU trade deal would mean the backstop would never need to be used. 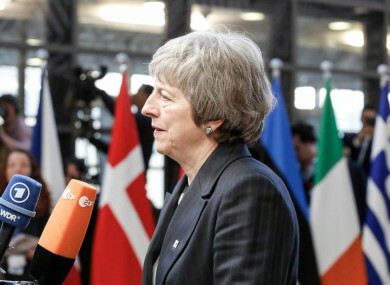 The leaders of the EU-27 are adamant there can be no substantive changes to the legally-binding agreement on Britain’s withdrawal from the bloc but have suggested that there could be some “clarifications”. Sources said leaders, in general, feel sympathy for May but can offer no promises. Several have publicly said negotiations on the deal, which took 18 months to hammer out, will not be reopened. May earlier admitted an “immediate breakthrough” on the situation is unlikely. British MPs are now expected to vote on the deal next month. May said her focus “is on ensuring that I can get those assurances that we need to get this deal over the line”. “I don’t expect an immediate breakthrough, but what I do hope is that we can start work as quickly as possible on the assurances that are necessary,” she said. May has signalled she will step down before 2022 – when the next general election is due to take place, but an election is likely to happen before then. “In my heart, I would love to be able to lead the Conservative Party into the next general election,” she said yesterday. But I think it is right that the party feels that it would prefer to go into that election with a new leader. Britain’s departure from the EU is due to take place on 29 March. Ireland is making contingency plans in the event of a no-deal Brexit, but Tánaiste Simon Coveney has said this scenario remains unlikely. Email “Varadkar says some of May's Brexit suggestions 'make sense', while others are 'difficult'”. Feedback on “Varadkar says some of May's Brexit suggestions 'make sense', while others are 'difficult'”.